Tuesday November 21, 2017 (OTTAWA) – On the eve of the 20th anniversary of the Krever Inquiry into the tainted blood scandal, parliamentarians, health advocates and health professionals gathered in Ottawa to call on the Trudeau government to uphold the landmark Krever Inquiry and rescind licenses granted to private, for-profit blood collection clinics that are selling Canadian blood abroad. Documents obtained through a Freedom of Information request* implicate Health Canada in working with the private blood broker’s unregistered lobbyist for years in the lead up to obtaining operating licenses, despite pan-Canadian opposition. The controversial private clinics were banned from operating in Ontario and Alberta to protect the blood supply. Canadian Blood Services (CBS), the public agency created in the wake of the Krever Inquiry, reported a decline in voluntary donors where the first private clinic opened in Saskatoon. CBS has issued multiple warnings to Health Canada and provincial governments to end support for the private collectors, citing a major risk to the security of Canada’s blood supply. There are plans to open a third private clinic in Saint John, N.B., with more expansion plans for Manitoba, Nova Scotia and B.C. BloodWatch is calling for an official apology from the Prime Minister to those who received tainted blood, federal recognition of November 26 as the day the Krever Report was tabled in the House of Commons and immediate action to rescind the licenses of all for-profit blood clinics. An estimated 8,000 lives have been lost due to Canada’s tainted blood tragedy. 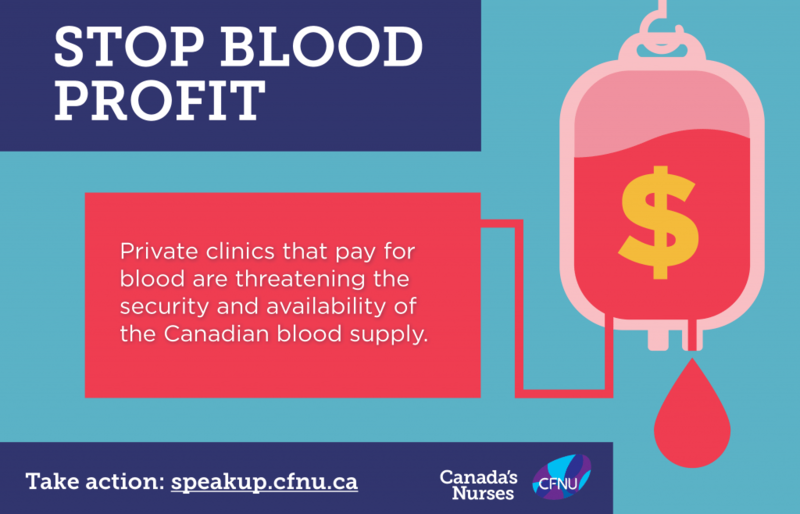 On the 20th anniversary of the tainted blood inquiry, tell Trudeau to keep our life-saving blood system safe by keeping profits out!